This site offers a report on how mobile-friendly your website is. One of the most important, impactful design changes you can make is moving to a responsive design. In March, Google officially announced they would be using mobile first indexing, which means Google now indexes sites on their mobile version, not the desktop version. This update was likely in response to the trend of mobile searches becoming the majority of searches performed on the search engine. If your website is hosted by a platform like WordPress or Squarespace, likely it will be responsive. However, there is an easy way to test the responsiveness of your site. Simply enter your URL into this site (pictured above) and get the results. This site will also offer a more comprehensive report that identifies specific pages that don't render well on a mobile platform. Having an optimized site will immediately improve the user experience and searchability of your website. Another crucially important component to e-commerce is to make sure your website pages load fast. It sounds simple, but is often overlooked, visitors will often abandon websites and pages that load slowly. We’ve all done it, and in a mobile-first world, this is every more important than ever, given that mobile phones typically have a slower connection to the web than computers. Start by evaluating your site speed with a free online tool like Pingdom. This will give you an overall score and recommendations of changes you can make to your site to improve performance. A note of warning: some of these suggestions might be more technically advanced, but if there are some easy things they recommend, this is another easy way to improve the overall performance of your site. Dollar Tree has an complicated navigation format - with competing navigation tiers and numerous options. Look at your top navigation, it should be condensed and well organized to achieve a limited number of goals. The nav should offer a way for visitors to understand what is shoppable online versus what is not. There should be a limited number of options for the online visitor in the top navigation. Essentially, you want to push them in the direction you want them to go. If you want them to browse, for example, don't make "browse" one of 6 or 7 options. 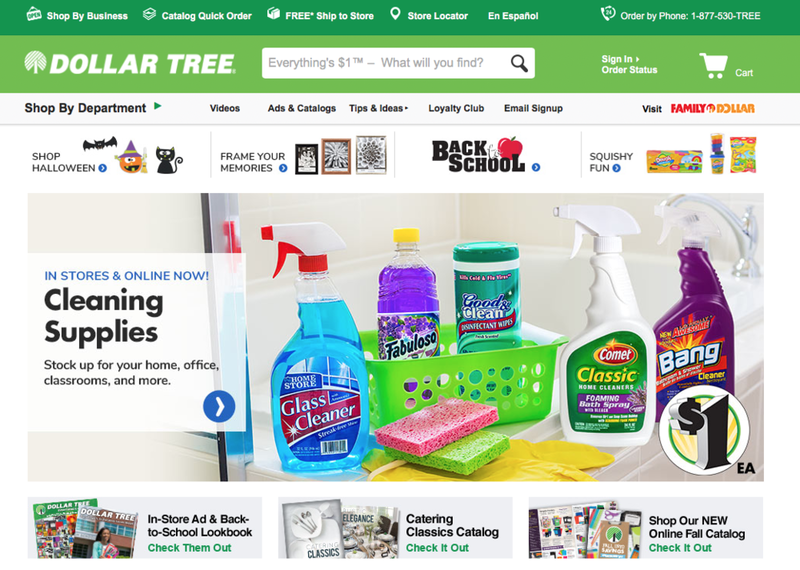 The Dollar Tree Example (right) is one of many options in the top nav. Note the desktop version of perigold.com (below). The header includes the log, search and cart icons are compressed at the top, yet easy to find and use, while the main navigation is slightly more spread out making it easier to view. This is considered a mobile-first design. Perigold navigation is 100% shopping focused. The top nav is limited to a search bar and user sign-in activity. The secondary navigation is simply a list of categories for the user can quickly find something specific. The Dering Hall website leads with "https," which yields better search results and improved consumer confidence. In the past, all websites operated on the standard HTTP protocol. E-commerce stores would pass users over to https once they got checkout pages of a website where personal information such as credit card numbers is collected. In 2018 it’s industry standard, and a best practice to operate your entire site over https starting with the homepage. As an incentive, other than just browsing privacy for visitors, Google has stated that it gives slight SEO preferential treatment to websites that use full https hosting. This is a simple guide on how to convert your site. Note that once implemented, all pages would show https in address bar similar to the example to the right. Showcase Beautiful Imagery: On websites, users respond to visual elements with the ability to engage by clicking on images they find appealing. Leading with oversize, beautiful imagery will give a great first impression of your site, especially in an industry that is so aesthetically pleasing. When you add photography, however, allow users to click images that resonate to find out more about the shown product, room or design. Decaso uses the promotional brand to highlight their trade program. Promotional Bands: Having a promotional message can be important on your site. If you want to highlight a sale, a new launch or an introductory offer, a promotional band is a great opportunity to do that. It offers topline visibility without taking up the valuable real estate on your homepage. Link your message to a landing page that describes the news or offer in more detail. Promotional bands are used in numerous websites. Here are examples from Decaso (to the right) and Nike (below). Notice the promotional bands (highlighted in red) directly under the top nav. Nike uses a rotating promotional band to highlight things like limited sales and their return policy. Collections and categories are represented by product and profile imagery. Less Text, More Imagery: Limit dense text throughout your homepage and instead highlight specific products, brands, or collections in a visual way. The following (Viyet and Joss & Main) are examples of how that space could be used featuring collections or even categories in a more visual way, leading to better engagement and conversion rates. Rather than write about the beautiful products featured on your site, consider showing examples with hyperlinks to product or profile pages. This creates a more visually appealing and interacive experience on your homepage. These categories are represented visually, creating a more appealing shopping experience from the homepage. 1stdibs makes the products the star of each product page. If you have product pages, use high resolution, silhouetted imagery. Instead of stacking images, allow users to click through images to keep users in one spot. 1stdibs (right) has beautiful product pages by allowing the image to be the star. Likely, your product pages are full of valuable information, but consider limiting the text and adding a “read more” button to allow readers to find out more if warranted. This will leave the details of the product available, but it will create a cleaner, more inviting first impression on the product page. You can see an example of thie below with Chairish. The highlighted red box exemplifies how Chairish allows their visitors to read more on a specific product or item without cluttering the page with text. Make your primary call to action high on your product pages so visitors do not have to scroll down to make a purchase or inquiry. Make this action, whether it's "add to cart" or "buy me now," the biggest button on the page. In the examples pictured, notice how both sites make the call to action large and high on the page. It naturally draws the eye. Take a look at your website with fresh eyes and make sure you are doing what you can, both on the screen and behind the scenes, to optimize your site. Often, your site is the first impression a visitor has with your brand. These five tips are a great first step in making this importance piece of your business even better. If you are interested in a more in-depth website review from Dering Hall, email marketing@deringhall.com for more informaiton.